We were recently asked by Lyonsdown School to design a new website and to improve their online visibility. We met with the headteacher, Lynn Maggs-Wellings and their marketing team on several occasions and we went to visit the school as we wanted to get an idea of what their staff, pupils and the school itself offered and what made Lyonsdown unique from other schools. 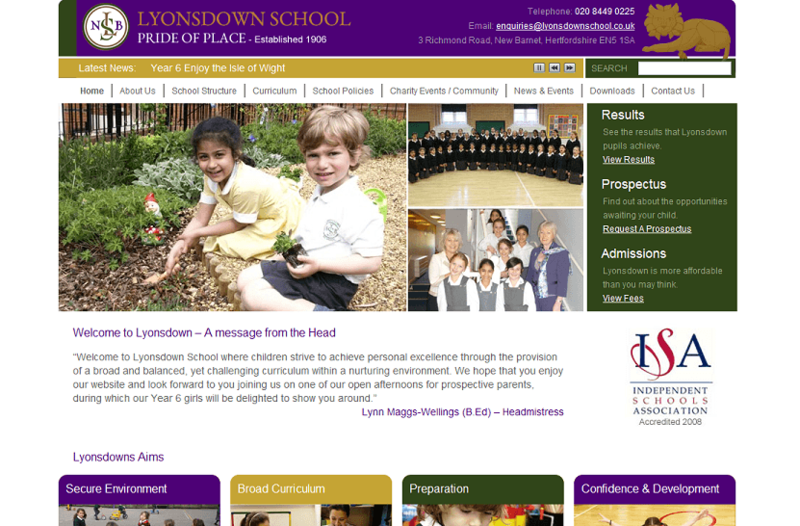 Lyonsdown have 8 aims that they strive for to make their school a successful place to learn and they wanted these aims to be clear on the homepage, so we designed a unique feature to portray this. We wanted to make sure that the design represented the quality that was on offer and we knew it was important for parents to be able to find the results, prospectus and admission pages, therefore these were placed in the top section of the homepage making them easy to navigate. “Private Primary Schools in London”, before optimising this keyword was not in the 200 for Google search, now it is #32. Because of the search engine ranking position improvements we’ve seen an increase in traffic. In June there were 463 visitors to the site through organic search engine traffic and in July we saw 631 organic search engine visitors. If you would like more information on school website design or our online promotion services including seo , contact Innermedia.